Processing payroll is a necessity, but finding the time and resources to stay on top of it is often a challenge for small business owners. Between compliance issues, calculating payments for different types of employees, and filing payroll taxes, handling payroll can feel like a full-time job. 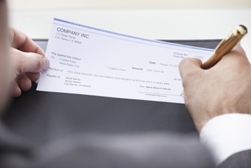 If you’re struggling to keep up with payroll, consider outsourcing your payroll processing to John Joseph Griffin, CPA, P.C.. We take the guesswork out of payroll processing and manage all your payroll tax filings and reporting needs. Don't waste any more time on payroll. When you outsource to us we’ll make payroll processing simple and painless for your small businesses. Call us at 773-545-6750 today or request a consultation through our website. We work with all kinds of small businesses in the Chicago, IL area.